Garlic has been used for centuries to fight all kinds of disease-it’s naturally anti-bacterial, rich in anti-oxidants and helps prevent cardiovascular disease. Make sure to eat more of this healthy and delicious ingredient to boost your immunity during flu season! This healthy recipe for garlic confit is very versatile-the resulting puree can be used to flavor salad dressings, as a dip or can be added to soups. And the leftover garlic infused olive oil is wonderful to cook with. Heat oven to 300°.Put ingredients into a 1-qt. pot, making sure garlic is submerged in oil. Cover pot; bake until garlic is golden brown and tender, about 1 hour. Let cool. and remove the garlic cloves from the oil. Save the oil for later. Puree the cloves of garlic in the food processor with some fresh tarragon or thyme, chives and parsley. Thin the puree with some of the garlic oil and add more fresh, chopped parsley and thyme until it has the consistency you want-some people may want to leave it thicker to be able to spread it on breads and crackers, or you may choose to make it almost a salad dressing consistency for dipping or drizzling on vegetables. Alternatively, you can blend the herbs with the garlic infused oil before thinning the garlic confit paste. 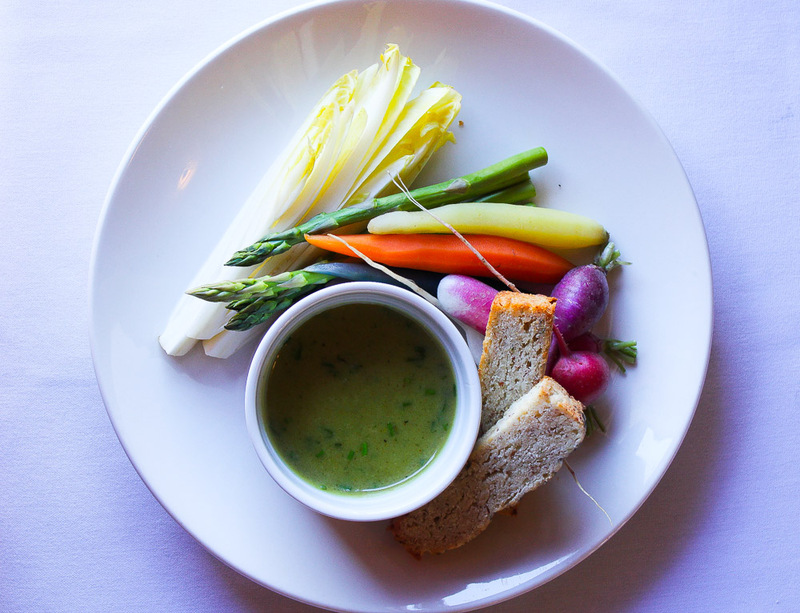 Serve the dip warm with fresh vegetables, such as baby carrots, endive leaves, radishes and asparagus spears. Optionally serve it with sliced sourdough baguette lightly toasted. I hope you enjoy this delicious and healthy Garlic Confit recipe-just try it when you feel a cold coming on! *In the video, we didn’t puree the herbs with either the garlic cloves or the oil, but simply chopped them by hand and mixed them in-this gives the dip a less green color than if they are blended in. I like the vibrant green color blending the herbs produces, but it doesnt make much difference for the final taste.